I love buying stuff from op shops, or thrift shops. Out of the clothes I’m wearing today only my underwear and my jeans were bought brand new. Everything else is from the op shop and the shirt was given to me but that was from an op shop too. I had a good haul a few days ago. 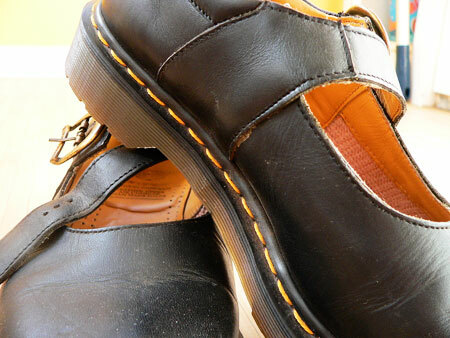 I bought a pair of Doc Marten shoes. They’re hardly worn so I don’t mind wearing someone else’s shoes. I also bought a pair of work pants. The shoes were $20 and the pants $6. Bargain. I’m kind of at the stage where I don’t buy a lot brand new and I certainly don’t spend a lot of money on new clothes. Even JJ’s clothes I get as many second hand as I can, especially as he grows a couple of inches every couple of months it seems. If I keep this up I’ll have enough money to spend on the food that JJ keeps eating more and more of. I’ve always bought the kids clothes and shoes from op shops as kids hardly wear them out before they out-grow them, plus some op shops get brand new straight from the factory past season’s clothes (Osh Kosh, Country Road, Just Jeans,Millers,etc). There’s an op shop blog for Melbourne with listings of all the shops, reviews, alerts on bargains, etc. Not sure if there’s one for South Oz, but it would be a great idea for one for every state/territory. I haven’t come across the South Aus equivalent op shop blog. I’ve got my one favourite shop and I’d be a bit loath to spread that news around due to selfish reasons naturally. I’d like to know which op shops get the past season’s kids clothes though. I’ve bought new clothes for JJ but they’re original 70s clothes. I’ll have to take some pictures of those! bargains especially the shoes – I don’t get into shops much these days – NSW is scarce on good op shops. My kids always had hand me downs (a benefit from large extended family) and once I bought my daughter a new dress and she didn’t want to wear it because it hadn’t belonged to someone she knew. It was funny. She quickly got over it though!